Does City Spending on Antismoking Efforts Affect Smoking Rates? A recently released American Cancer Society annual report says that based on federal Centers for Disease Control and Prevention guidelines New York State failed to invest sufficient funds last fiscal year on antismoking efforts. 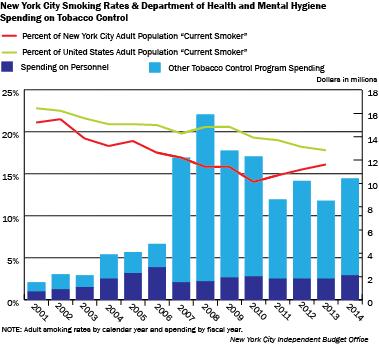 IBO’s review of New York City’s own spending on antismoking programs finds that spending levels have varied widely in recent years—and that after trending downward the local adult smoking rate has been increasing. In 2002, the city’s Department of Health and Mental Hygiene launched its tobacco control plan for reducing smoking among city residents. The plan included: hiking taxes on tobacco products; distributing cessation aids for current smokers; advocating for and enforcing antismoking legislation; and running public education campaigns on the consequences of tobacco use. Spending rose steeply in 2007, with the increase driven by advertising, media campaigns, and nicotine replacement therapies, rather than agency staffing. Tobacco control spending jumped again in 2008—reaching more than 10 times the 2001 level—even as spending on agency staff barely grew. A three-year decline in spending followed in 2009 through 2011, with all of the cuts coming from sources other than health department staff. The impact of the tobacco control plan on smoking behaviors occurs with a lag because of the time it takes individuals to cut back or quit—and particularly for spending programs, the time it takes to launch new initiatives. In calendar year 2002, the city and state each hiked their excise taxes on cigarettes to $1.50, for a total of $3.00 per pack. With additional state increases in 2008 and 2010, the combined state and local tax is now $5.85 per pack, plus an additional $1.01 per pack federal tax. The big increase in city spending on antismoking programs, along with the tax increases, have been credited with reducing the smoking rate in the city during a period when the U.S. smoking rate barely declined. In 2010, the city’s smoking rate fell to 14.0 percent, a 15-year low and 5.3 percentage points below the U.S. rate. After 2010, smoking rates in the city began to rise, reaching 16.1 percent in 2013 (the latest data available), just 1.7 percentage points below the U.S. rate. The increase in the city’s smoking rate occurred in tandem with declines in spending on tobacco control programs. City spending on antismoking campaigns in 2011-2014 averaged about a third less than during the 2007-2010 peak spending period. Health department officials have cited the decline in spending on tobacco control as a cause of the increase in the share of adults who smoke. With $5.0 million budgeted for tobacco control in the current fiscal year, less than half the amount spent in 2014, there is concern that the smoking rate could continue to rise.